In addition to grass seed, the family farm raises green beans and sweet corn for NORPAC Foods, along with hazelnuts and peppermint. Irrigation is essential to the operation, Butler said. That is why a major proposal 30 miles upstream at Detroit Dam has him so concerned. The U.S. Army Corps of Engineers, which maintains 13 multipurpose dams in the Willamette River Basin, wants to build a 300-foot-tall water temperature control tower and floating screen at Detroit Dam to benefit native fish, including endangered chinook salmon and steelhead. However, construction of the project may require draining Detroit Lake — the reservoir that feeds into the North Santiam — for up to two full years, leaving farms parched during the dry summer months and vulnerable to flooding during high river flows. Butler, who serves on the board of directors for the Santiam Water Control District, said the impacts could be devastating for agriculture in the Mid-Willamette Valley. Farmers are not the only ones who would be impacted. The cities of Salem and Stayton both get their drinking water from the North Santiam, and Detroit Lake is a popular destination for fishing, boating and outdoor recreation that drives tourism in the area. The Army Corps is currently considering five construction alternatives with varying levels of drawdown at Detroit Lake. Tom Conning, spokesman for the agency’s Portland District, said it is still early in the process and will take years to complete an environmental impact study before work can begin in 2021, at the earliest. Butler said local farmers are not pushing the panic button yet, but they realize how much is at stake. 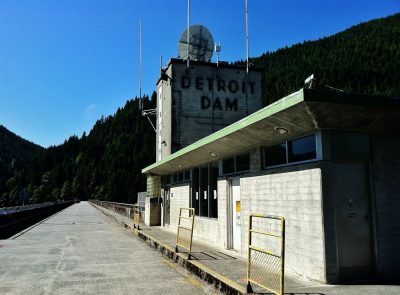 Completed in 1953, Detroit Dam is a 450-foot-tall concrete structure on the North Santiam. It provides 321,000 acre-feet of water storage and has a peak electricity generation capacity of 100 megawatts. It is also a barrier for salmon and steelhead that migrate to the Pacific Ocean before returning up the river as adults to spawn. Over the last 10 years, fewer fish have returned on average into the Upper Willamette Basin compared to the previous 50-year average, according to the Oregon Department of Fish & Wildlife which tracks passage at Willamette Falls Dam. Combined spring and fall chinook returns averaged 11,757 fewer fish per year, or roughly a 24 percent reduction, while winter steelhead returns averaged 3,852 fewer fish, a 41 percent reduction. To protect the species, the National Marine Fisheries Service issued a biological opinion — called a BiOp — in 2008 outlining what the Army Corps needs to do to improve fish survival. Part of the BiOp includes the project proposed at Detroit Dam, said Conning, the Corps spokesman. “Basically, (the BiOp) gave us some recommendations for reasonable, prudent actions to take so we did not violate the Endangered Species Act,” Conning said. The plan has two components. First, the Corps would build a temperature control tower — called a selective withdrawal structure — roughly the height of a downtown Portland building next to Detroit Dam. It would mix water from different levels of the reservoir to ensure the water released downstream is neither too warm nor too cold for the fish. “Salmon need a specific temperature to navigate all the way back to where they originally spawn from,” Conning said. The second component would be a floating screen structure about the size of a football field to capture juvenile fish swimming downstream in the reservoir so they can be moved past the dam either by truck or bypass pipe. Together, Conning estimated the work will cost between $100 million and $250 million. But first, the Corps must complete its environmental impact study evaluating the impacts on everything from aesthetics to the water supply. “We’re getting feedback from the public about their concerns,” Conning said. For farmers, the chief concern remains how the Corps plans to build the project, and how that will affect the irrigation supplies. Building in the dry poses the lowest safety risk of the alternatives, but potentially has the greatest impact on water users. Building in the wet, on the other hand, has the lowest impact on water users, but is the most expensive and dangerous of the five options. Another option involves building a temporary coffer dam around the construction site, allowing the reservoir level to remain higher. The Santiam Water Control District was formed in 1954 and is responsible for delivering irrigation water to more than 17,000 acres of farmland, along with water to three hydroelectric plants and other uses. The district also provides the majority of municipal water to the city of Stayton, population 8,080. District Manager Brent Stevenson said the project details are still fuzzy, but each of the Corps’ five alternatives describes at least one season with reduced or no stored water. The value of the crops grown in the area adds up quickly. Marion County is the top agricultural producer in Oregon, according to the 2012 USDA Census of Agriculture, with 286,194 acres of farms generating $592.8 million in farm gate value. The district provides water to about 6 percent of the county’s farms. Mary Anne Cooper, public policy counsel for the Oregon Farm Bureau, said the organization will submit comments to the Corps, and has big concerns from both an irrigation and flood control perspective. The Corps won’t release its draft impact study until next year. Until then, Conning said the agency is urging stakeholders to provide feedback that will help it analyze each alternative. Steve Keudell, a board member of the Santiam Water Control District and co-owner of Keudell Farms in Aumsville, Ore., said draining Detroit Lake for any period of time could potentially alter the face of farming in this part of the Willamette Valley. In 39 years of farming, Keudell said he has never gone without irrigation water for his fields. On Tuesday, Stevenson submitted four pages of written comments to the Corps on behalf of the district. He asked the Army Corps to complete a detailed “water budget” identifying all legal water rights, which would then be reviewed by the Oregon Water Resources Department to determine exactly which rights would be vulnerable during the project construction. The district also wants to the Corps to analyze which flows may released from the nearby Big Cliff Dam during construction. Big Cliff Dam is 2.7 river miles below Detroit Dam, though it does not store nearly as much water and is instead relied upon as a “re-regulation” dam, smoothing out flows from power generation at Detroit Dam. “It is critical to understand if Bureau of Reclamation stored irrigation water will be available during the construction period,” Stevenson wrote in his comments. He added the federal Bureau of Reclamation should be included as a cooperating agency on the project. For now, Keudell said he is trying not to get too alarmed and carry on business as usual. “I just don’t know how it’s going to work,” he said.